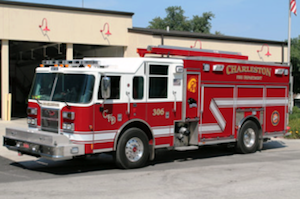 The Charleston Fire and Police Commissioners approved first responder eligibility at its December meeting. The Charleston Board of Fire and Police Commissioners approved first responders’ test scores and certified a local police officer during a general session meeting on Dec. 14. With Chairman Reed Benedict presiding, the board unanimously approved test results for entry-level firefighter-paramedic personnel who sat for the examination on Dec. 5 -- endorsing their initial eligibility as well -- and granted final certification to Police Officer Robert Hale, effective Dec. 31. Advised that one first responder, Firefighter-Paramedic Aaron Rice, has been on active military duty but expects to be released in early 2016, the board extended Rice’s period of probation. He has been on active duty for 11 out of the total 12 months of his employment thus far. Bennett reported that communication is ongoing and that he has mailed Rice an application for the fire academy. Additionally, the board unanimously approved minutes from the General and Executive Sessions of Nov. 9, 2015. Those in attendance at the meeting included board member Keith Perry, Police Chief Bryan Baker, Fire Chief Pat Goodwin, Assistant Fire Chief Steve Bennett and board secretary Debbie Burkhart. Board member Barb Marquis was absent.